Greetings my sisters and brothers, I pray that you are in your complete and confident faith filled with radical trust and focused on our Lord Jesus. A Word of Encouragement to you all= Keep your expectations in the Lord Jesus--Keep Building what He has called you to Build! 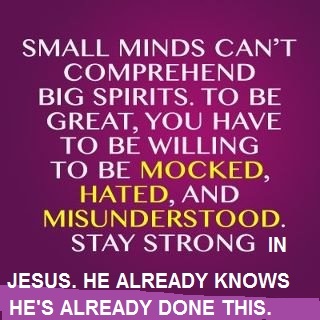 When critics begin to speak against you, gathering others to join them, no matter what lies they tell, how they spin what they say about you, nor how many they get to join in with them., Stay Focused on Jesus and God's Purpose for you!They speak through their brokenness, through their hurt and jealousy, they are open to the enemy's work, that is why he is using them to Try and defeat you, to distract you, to get you from walking and living Through God's Spirit to walking and living through your flesh. KEEP doing what you have been Called to do! Don't give them any of your time, energy, money, strength, or attention. Keep your focus on Who holds the details of your life, your mission, your work, your assignment, your purpose. THIS Is Not the Time to Get Offended! It's The Time to stay Focused, and Keep Building what You have Been Sent to Build! God is in the midst of the Details of your life and purpose, not the enemy. Of course they will come against you.... Aren't You serving God in the name of Jesus? Aren't you healing people? Aren't you feeding, clothing, giving water to people who need? Aren't you helping people find jobs, getting health care, vehicles, education, and helping them with their children? Aren't you Bringing the Love of Jesus to them? Aren't you obeying the Leading of the Holy Spirit? Aren't you allowing your heart to be Opened? Aren't you learning what you need to learn and being corrected in what you need to be corrected in? Aren't you spiritually growing and maturing? AREN'T You bridging the Gaps that exist, that seek to swallow up More and More people? So With Joy, With Peace, With Faith and With Trust = Remember Who Chose and Called you to do what You are doing = Keep Building What you have Been Called to Build, and let the critics keep speaking against you, They will not succeed unless you allow them to do so. Pray for them, and leave them in God's Hands. Remember, Jesus Never let His critics change His focus nor did He get distracted from His Purpose! He sometimes never even responded to them directly! He allowed His Actions to Speak for Him! He allowed God's Glory to Speak for Him. He allowed His Purpose to Speak for Him. Remember, you Have What you Need to Do What You have Been Called to do! Stay Focused on our Lord and Do what ever He tells you to do! Glory be to God in the Name of Jesus, So Be It! "Am I now trying to win the approval of human beings, or of God? Or am I trying to please people? If I were still trying to please people, I would not be a servant of Christ." DAILY PORTION- "...BRINGS NO SORROW..."